I have wanted a new dream pillow for a while now but had got around to making one so I decided to get on with it and make one. 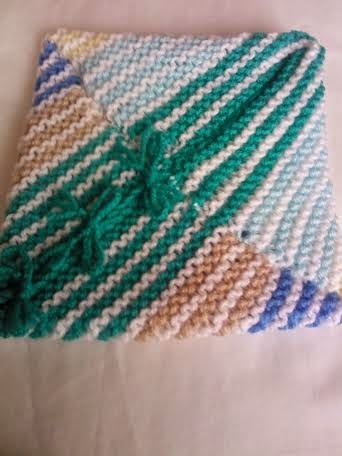 All I did was knit a large square by casting on 50 stitches on 5mm needles and changed colours every two rows keeping white as the main colour and adding new colours as I knitted. I chose garter stitch as it creates a flat piece of work. I created the pillow by folding the corners into the middle of the square and sewing the seams leaving one seam open. This will allow me to add the filler and the lavender. To close the opening I added plaited yarn that I tied into bows. This Dream Pillow was created from a square that turned out too large for my project I used the wrong needle size by mistake. This time I folded the square so that it formed and envelope using the blue as the envelope flap. Then I plaited some yarn and attached it to the point so that it was looped and the two ends pulled through the loop to secure it. I also added a plaited ring to the bottom of the square so that it closes by tying the two plaited strands into the ring. My Husband says the tie looks like a long armed person with very short legs, that was not the plan but it does look a bit like a person I suppose. Again the stuffing can be added with the scent I want to the pillow. With both of the Dream Pillows I will add the stuffing to a simple cotton pocket so that I can refresh the Lavender when I need to. Dream pillows go under your pillow on the bed or inside the pillow case and can be filled with Lavender or Rose Petals and even dried Hops. Lavender and Hops are good for relaxing and Roses always go well with Lavender. 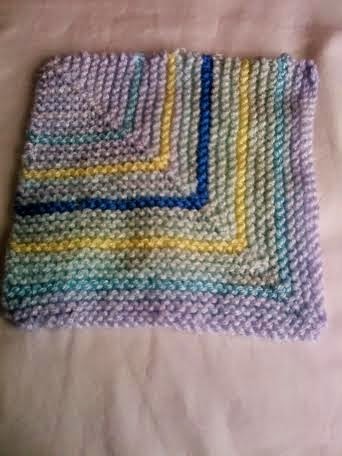 No wasting knitted squares that turn out too large I can now make something from them like a Dream Pillow. So onto the new squares that I have made for the afghan that I will eventually complete. 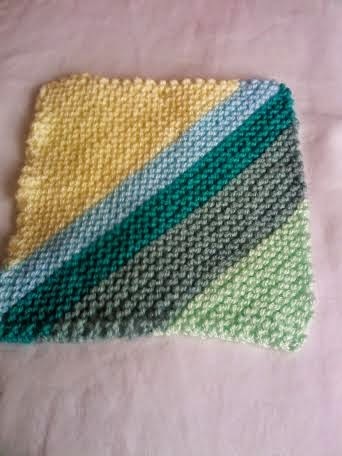 I say eventually as I get fed up knitting squares and make something else for a while and go back to the squares again. 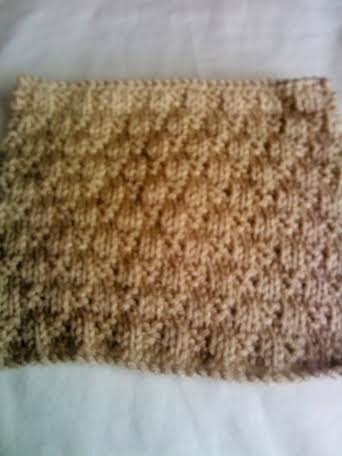 I love this it is so easy to do and looks really nice in a lighter colour, for this one I chose a soft light brown and used 4.5cm needles to get correct size. Some times I end up having to leave the last section of the pattern as the square is the correct size before that. So this was created repeating the the pattern as described Repeat Rows 1-8 four more times ending with Row 8. The last section Repeat Rows 1-6 once again was not needed as it was large enough, had I continued it would have been too large. This is yet another double decrease square with colour changes and I love making them it is such an easy pattern with endless possibilities for colour changes. This one needed 4mm needles to get the right size. Okay not purple but a mix of greens, blue and yellow but it worked. 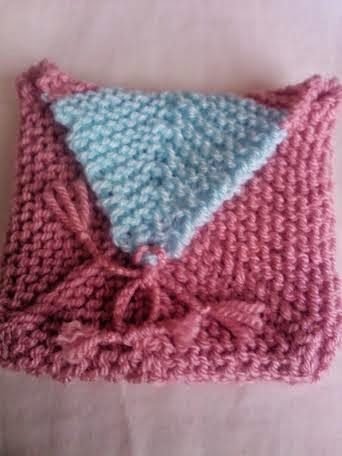 Knitted using 4mm needles, I have found that you need to keep changing needle size for the squares to turn out the same size and sometimes decrease the amount of rows as well. That is probably just me as we all knit to different tensions but I have found that the squares look fine even if I do have to later things a bit. It will be something new for me to try and will make a nice colouful blanket and use up loads of scrap yarn in the process.